Prize: 6 winners: An American Treasure Super Deluxe Box Set, featuring four CDs, 60 tracks, and an 84-page hardbound book with photographs and an essay from Nicholas Dawidoff. 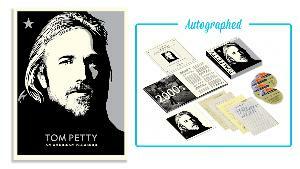 Box set will be autographed by The Heartbreakers + more ($1,260/each). Statistics: This contest was opened by 32 and entered by 0 ContestChest.com members. 0% of those who opened the contest, entered it.